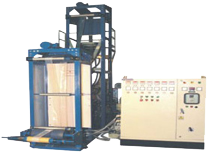 Zip Lock extruder machine to manufacture zip lock LD, LLD, PE films with colour mark, consisting of one main extruder and one Jockey extruder driven with AC main motors with variable frequency drives fitted with cross head and die, air cooling ring with blower, control panel. Two No. of Vertical take up unit and complete with all standard electricals and accessories as detailed in the specifications.